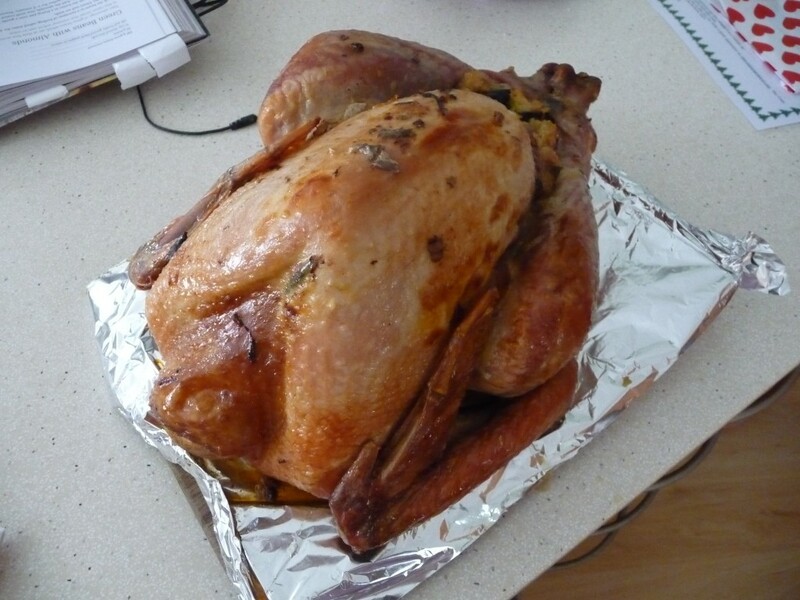 This Christmas I conquered one of my food fears – I roasted a whole turkey and, thanks to a block of butter and frequent basting, the end result was not turkey jerky AKA the dinner scene from the classic Christmas movie, National Lampoon’s Christmas Vacation (You Tube link for the uninitiated here). I stuffed my turkey with a whole lemon, as well as an apple, prune and pistachio stuffing – based on a recipe found in the book Margaret Fulton’s Christmas. The recipe below makes lots of stuffing, enough to stuff the turkey, as well make an extra stuffing log which can be served as a side dish. Tip No. 1 - Stuff lots of butter under the turkey skin. Tip No. 2 - Baste regularly. Line a large roasting tray with foil (this will make clean up much easier!). Put this roasting tray aside for the turkey. On a separate baking tray, layout the torn up bread rolls in a single layer. Place in the oven and bake for between 10 and 15 minutes (you want the bread to dry out, but not to brown). Wash the turkey inside and out and dry thoroughly with paper towel. Place the turkey – breast side up – on the prepared roasting tray and allow it to come to room temperature while you prepare the stuffing. Heat the olive oil and 50 grams of the butter in a fry pan over medium heat and cook the onion and garlic for approximately 5 minutes, stirring until soft. Add the grated apple and cook for a further 2 minutes. Transfer to a large bowl. Add the torn up bread rolls, prunes, pistachios, sage, thyme and the finely grated rind of 1 lemon to the bowl. Season with salt and pepper and mix with your hands until the stuffing mixture is well combined and holds together. Heat 100 grams of butter and the wine in a small saucepan over medium heat. Once the butter has melted, remove from heat and set aside for basting. 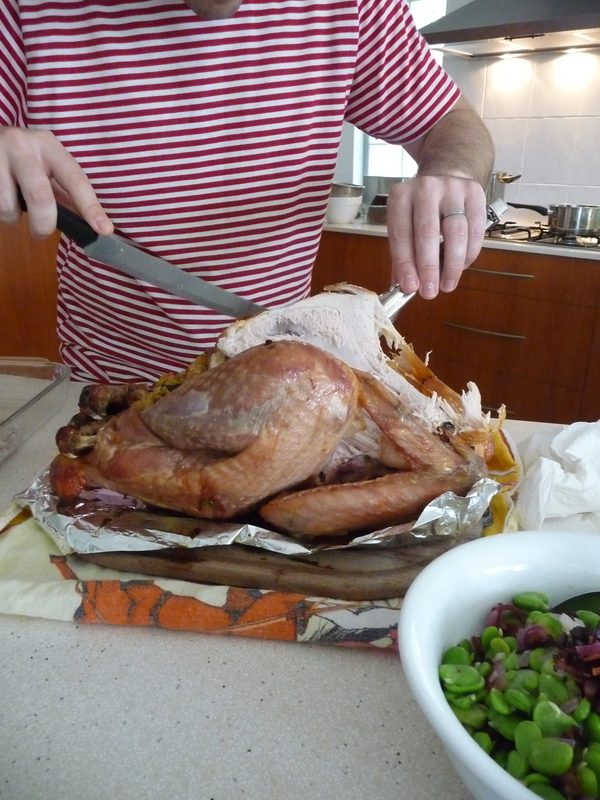 Using a sharp knife, carefully make 2 or 3 small incisions under the turkey skin – on the breast side. 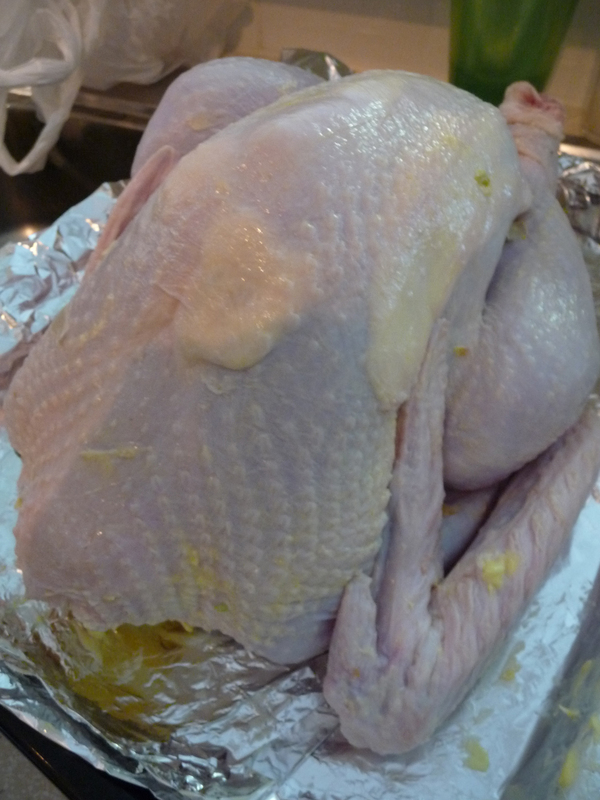 Insert the remaining 100 grams of butter into these incisions and rub over the the entire turkey breast area. Place half of the stuffing mixture into the rear cavity – closest to the drumstick end of the bird. Shape the remaining stuffing mixture into a log shape and wrap in aluminum foil. Put the stuffing log aside. Place a whole lemon into the neck cavity – closest to the wing end of the bird. Truss the turkey legs together with cooking string (or get your butcher to make an incision in the skin which will allow you to tuck the legs together without string – this is what I did). Baste the turkey with approximately 3 Tablespoons of the wine and butter basting liquid and cover tightly with aluminum foil. Place the turkey in the preheated oven and cook for a total of approximately 4 hours (cooking time will vary depending on your oven). Baste the turkey with approximately 3 Tablespoons of the wine and butter basting liquid every 20 to 30 minutes. After 1.5 hours of baking time, reduce the heat to 160 degrees Celsius. To ensure a deep golden brown colour, remove the aluminum foil from the turkey and cook uncovered for the last 1 hour of cooking time. 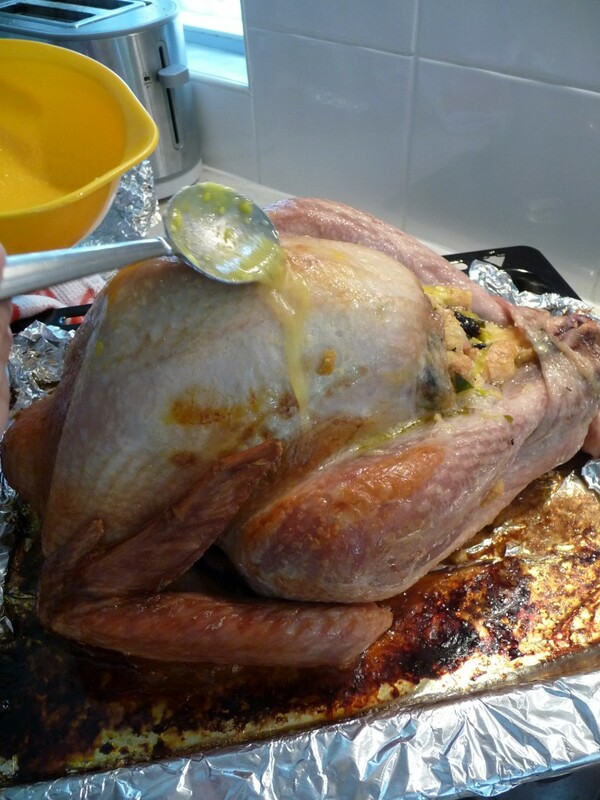 To check if the turkey is cooked through, pierce the thickest part of the thigh with a fork or skewer. If the turkey is cooked, the fork should go in easily and the juice will run out clear. If the juice has a pink tinge, further cooking is required. Once the turkey is cooked, remove from the oven, cover tightly with aluminum foil and allow it to rest for 30 minutes. While the turkey is resting, place the stuffing roll in the oven and cook for 30 minutes on 200 degrees Celsius. Once rested, watch The Brooding Architect carve the turkey and serve with a slice of the stuffing log on the side. The Brooding Architect carving the bird (note the suitably festive attire). Hannah: Don’t feel disgruntled! Your apple and chestnut stuffing looks and sounds amazing. Might give it a try later this year – with an added handful of dried cranberries – once I am ready to eat again after the gluttony of Christmas! Hi, this is something i am very interested in trying out. I have not tried roast turkey stuffed with apple, pistachio and prune. The description is easy to follow. Sometimes I turn my turkey upside to prevent it from drying out and later on I turn it upside.